So right off the bat, we can say the female represents part of Nicolas Cage's character. He is associated with fire (he is literally on fire in the poster), hence duality, the ability to provide warmth/cook food, but also destroy. 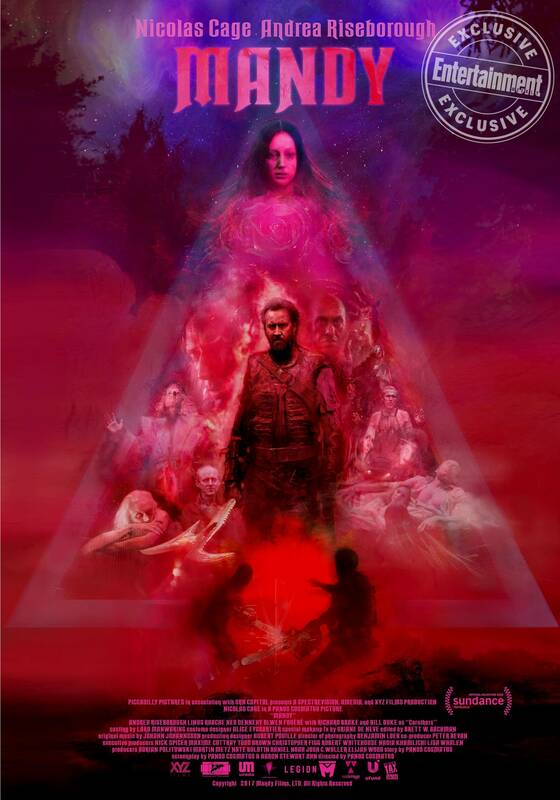 The poster is laid out with the classic Illuminati pyramid/triangle shape. There is very much a sense of the chakras. The female face is above Nicholas Cage's face. At the bottom, the bottom chakra in this interpretation, you see two men with chainsaws. It looks like a battle. Duality. Blue at the top, red at the bottom. A rose, which immediately reminds one of the occultists, Rosicrucians. "Under the crimson, primordial sky, an ancient warlock reached into the dark embrace (??). His fist closed around the serpent's eye. Strange and eternal." Now if you know my view on extraterrestrials and interdimensional beings being one and the same (with interdimensional being the better explanation, IMO) things get even more interesting. Share your thoughts!